This was a happy pre-Christmas session that saw all our wayward players able to make it to the table after some absence. For those that had set up activities for their characters while they were gone, I rewarded their efforts with small special abilities. Tykris had spent time in the church tending to the sick, so I granted him the ability to heal anybody 1 hp per day. In addition, should he be able to use an action the round immediately following a character's death, I gave him the ability to allow that character a chance to Save vs. Death to be stabilized unconscious at 1 hp. Arkmed the Dwarf had been apprenticing with the bronze workers at the Dwarven colony north of Headwaters. I gave him the ability to craft bronze. If he gathered enough bronze, he could craft anything he desired between sessions. At the beginning of each session, he gets to roll a die to see if the task is complete. Turgon the Magic User has been collecting scrolls and tomes for a library. Should he have a specific question about something the party does not know and is willing to put in the research time, he has a chance to find the answer in his library. The beginning of the session had the veterans of the party doing trial and error with some of the magic items they had found in the hoard of the giant winged ape. This is an aspect of the game I truly enjoy. As utilitarian as an Identify spell might be, it isn't nearly as gratifying as figuring out what an item does by actually using it. Indeed, there are still abilities yet to be discovered with some of the items. Of interest to me, the players have taken a decidedly religious demeanor in their play. They tithed to the church in Headwaters, gave a couple of gifts to the cathedral when they arrived and also spent some time giving out alms to the beggars they encountered in the bazaar. We role played the encounter with Bishop Jova and everyone got into their roles and seemed to enjoy themselves. Jova informed them that the murders took place almost exclusively in the slums. He was having a difficult time convincing the upper class and the local guard to act. Thus, he called the party in hopes of finding out what was going on. Jova was also keen on one of the objects that the party found in the treasure hoard of the giant winged ape — an icosahendron with strange writing and symbols. He insisted that it was a map to an ancient city once inhabited by a people ancient to those that the colonists encountered upon their arrival on the continent. He openly wondered if there was a connection between that city and those who wore the golden masks. Turgon then set out to meet with his mentor at the Magic College and Hamlen set about trying to find information from some prostitutes. Turgon learned that the expert on the ancient peoples of the continent was not currently in the city and that no one had seen the king in public for over a month. Hamlen found himself a one armed, one legged prostitute who was willing to tell him what she had seen — some kind of ghoulish monster collecting bodies and taking them into the necropolis at the edge of the city. Hamlen then took pity on her, paid her far more than he had offered and promised to return and take her to Headwaters with him should she so desire. The rest of the evening was spent exploring the necropolis where the party encountered both hostile and friendly undead. They learned that something untoward was happening in an abandoned castle in the necropolis. They subsequently fought their way to the highest tower where they found a mask wearing necromancer sacrificing the drained blood from several corpses for some unknown ritual. In a tense battle with copious uses of Hold Person, smoke bombs, mirror image and fire and oil as well as the appearance of a lot of zombies, the party defeated the necromancer. Hamlen then dragged the body into the magic circle the necromancer was using in his ritual, and slit the corpse's throat. As blood hit the floor, the circle glowed red, the entire castle shook and a low groan emanated from the bowels of the tower. Having barely survived the encounter with the necromancer, the party decided retreat. Today, Hades groaning cries out, “It would have been better for me if I had not received the One born of Mary, for He came upon me and destroyed my power. He shattered the gates of brass and the souls which I held captive of old He resurrected as God.” Glory, O Lord, to Your Cross and Your Resurrection! This image comes from Psalm 107:16, "For He crushed the gates of brass and shattered the bars of iron.” Read in context, from the perspective of of Christ (justified by verse 20, "He sent His Word and healed them, and delivered them from corruption"), it portrays the lost souls from the beginning of time shackled in Hades freed from their bonds by the crucified Christ. This got me thinking, since my mind has been on world-building of late, about how to translate this image into a fantasy RPG setting. My initial thoughts would make it an urban campaign, because the image of the shattered gates requires some kind of limited space. The city could be called by several names (all derivatives of Hades or Hell): Adys, Adoon, Uffern, Kolasy. The city lies on a plain in the Land of Nod, where demons freely roam. Many years ago, a dead man, who was also the Living God was brought to the city and broke down the Brass Gate — the only way out of the city into the Land of Nod. Thousands, if not millions poured out of the gate and few have ever returned. Those living in the city are lost souls who, out of fear, forgetfulness or coercion choose to remain. The city could contain all the classic urban fantasy tropes including a megadungeon beneath the city that promises vast amounts of wealth to those that dare to delve its depths. Players would play characters that forget that they are dead and forget who they were and what they did. As they adventure, the Referee could leave clues about who these characters really are. Character death would be relative. Raise dead could be readily available for those willing to pay the price. The underlying goal of the game would be getting through the Gates of Brass. This quest could be accomplished via a classic sandbox campaign where the city itself is the campaign world, or for those willing to do the work, could be as complicated as remembering their real selves (most probably horrible people who have rejected God and his creation whole sale). I don't know if I'd ever actually produce such a campaign world, but I enjoyed the kernel enough that I thought I'd share. 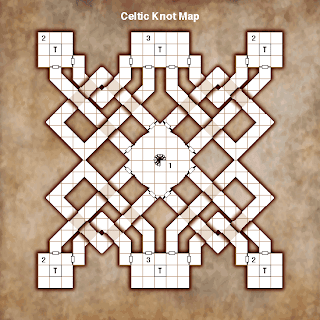 I am a big fan of celtic knots and was wondering how one might look and function as a dungeon map. This is designed to be a pair of identical sub-levels in any existing dungeon. The entire map radiates of magic. 1) Entrance. At the center of this circular room is a set of spiral stairs going up. All the doors are of the same smooth gray material, open whenever anyone approaches within 5 feet and close when when no one is within 5 feet. 2) These rooms are featureless. The doors are similar to Room 1 except that they do not automatically open. The 'T' at the center of the room indicates a trigger for a teleportation device that teleports everyone in the room to the corresponding room in the other identical sub-level. 3) These rooms function as Room 2; however on the wall without any doors are four levers. They are colored Green, Blue, Orange and Black. Currently they are all in the down position. Unless the Referee decides otherwise, they have no function. There are two things that struck me about this session. The first had to do with maps. When exploring the ziggurat that seemed to be the source of raids against trade caravans headed to and from Headwater, the players took care to make a map and make notes of what they did not want to tangle with while only two players were available. This week, we had a fuller slate of players and a random roll produced an NPC magic user newly arrived with the first caravan seen in some time. The party hired him on and retained the services of the surviving mercenary they had with them last session. The players then proceeded to take out the map and study it, planning their next assault based on what they had seen before. This delighted me, as this is an aspect of the old ways that (being a bit of a map geek) I truly adore. The party was well rewarded for their efforts — the tactics that they used as a result of their map worked brilliantly. This leads me to my second observation. The party tackled a couple of monsters that they probably had no business trying to take down, and they succeeded because they used tactics and took advantage of terrain to great effect. Older versions of D&D allow for this — the system is mechanically wide open enough to allow players to be creative in combat situations. The Referee, in turn, is free to make ad hoc decisions on a case by case basis as to how much such creativity affects the situation. In other words, as a Referee I was free to reward the players for their planning, foresight, cunning and creativity. Please note: the creatures they attacked would have easily killed the entire party in a straight fight, and even with all that planning, forethought, cunning and creativity had it not been for a couple of lucky rolls, one or more characters would have died. Thus, the players came out knowing that they had truly succeeded on their own merit. In my own experience, this is in contrast to combat in 3.5. The mechanics actually get in the way of the kind of creativity displayed by my players. When every aspect of combat is covered by a universal mechanic and a character is not a combat specialist, the mechanics themselves make creative play too risky to even try ("that sounds great, but the DC is still going to a 20"). I have even witnessed a combat where the mechanics actually made it impossible for the party to win. Understanding this, the DM allowed the party to succeed by fiat. This destroyed all sense of accomplishment and rendered the whole exercise meaningless. The party defeated a pair of monstrous ape-like creatures with creative use of spells and coordinated attacks. The NPC magic user, Xerxes, proved to be extremely useful — his Charm Person and Light spells were used to great effect. He was also fun to role play — he comes off as an arrogant academic that plays well against the bravado of the party. As an example of the creativity used by the party, they took the head of one of the ape-creatures and cast a Light spell on it. They then used it to intimidate a couple of groups of humanoids (I rewarded the party with morale checks, one of which proved critical). This was the first time the party managed to find some significant treasure, including a couple of things that are magical. The party has not yet had the courage to try anything out, so we shall see what comes of that. There are also a some new rumors that the party has come across. Dn. Guron has been in communication with his bishop. It seems that there is a single reference in an obscure scroll in the Church's archives to a lost city deep in the Giant Insect Jungle that is somehow connected to the mask the party found in session 4. There has also been a rash of murders in the city that has the bishop concerned. In addition, the party was able to confirm a rumor from the recent caravan arriving in Headwater — the orcs are no longer at the Monastery. The party noted tracks going into the Monastery, but none coming out. Within the tradition of the Church, there are plenty of things that can be translated into a fantasy RPG world as "magic" items. These can be broken down into three broad categories: sanctified items, holy objects and relics. Several times during the year, various foodstuff is brought to the church to be blessed and sanctified. These include, but are not limited to: oil, grapes, bread, water, and cakes. In game terms, these items, when consumed, might heal a hit point or bestow a bless spell for a certain amount of time, etc. Most of these items would have limited availability, because the services that sanctify them occur only once or twice a year. Thus, a fantasy world could include a calendar with several feasts (the Orthodox Church has twelve major feasts besides Pascha, aka Easter). Foodstuff is usually blessed on or around several of these feasts. This could add an interesting dimension to any RPG world. Throughout the Orthodox world there are miracle working icons. For example, at the Iveron Monastery on Mt. Athos there is a icon of the Theotokos (the Virgin Mary) that was stabbed with a sword by a pirate. The sword hit the Theotokos in the chin and the icon began to bleed. The encrusted blood is still there today. Other icons are known to "weep" — myrrh flows from the eyes of the saint depicted. In addition, there are several objects, such as the sash worn by the Theotokos from the hymn above, that were worn or used by various saints. In game terms, these could act as spell storing devices that can hold and then cast a number of divine spells a day. The myrrh from a weeping icon, when placed on a wound, might bestow a healing spell of some kind. The use of this myrrh could be limited to once per day or week per person. Other items, such as shoes or belts could act as variations on regular magic items — like boots of leaping or a ring of protection. This way, however, the item has a name and a backstory. In churches around the world, bones and body parts of saints are kept within churches and places of pilgrimage. As macabre as this sounds, it has to do with Christian anthropology, which has a holistic understanding of the human person. The body is an integral part of who we are. A saint has been transfigured by God and therefore their body — their remains — have been imbued with holiness. One of the most dramatic examples of this can be seen in Thessoloniki with the body of St. Demetrios. His body continuously exudes myrrh. So, when you go to his reliquary, you are assaulted by this sweet perfume that smells better than anything in the world. In game terms, these would be more along the lines of artifacts that would be able to do miraculous things; however, there should be a danger associated with using them — if used in a selfish or evil way, curses, bad luck, or extra attention from evil organizations or creatures should quickly follow. On top of that, there should be no end to beings that would want to try and steal or destroy such objects given the opportunity. This is a difficult subject to tackle in a fantasy RPG, given the metaphysical, spiritual and practical ramifications of including it in a game. However, I wouldn't discourage a player who wanted to play a character for whom taking communion on a regular basis was part of their story. Personally, I like to reward that kind of effort in my players and this reward often takes the form of home-brew mechanics, XP rewards or special abilities. In terms of communion, I would want to do something that encouraged players to make it a part of their characters' lives without it breaking the game. Personally, I allow characters who have gone to the trouble to taking communion to have one re-roll during a session. This gives players another expendable resource that can increase the tension of a session, be fun, and not overpower the game. Historically, the Church has existed in one of two conditions — tolerance or persecution. I use the word tolerance because even in times when the Church is seemingly in power, its fundamental principles come into direct conflict with those who are primarily motivated by money and power. I can't begin to count the number of times bishops came into conflict with Christian kings and emperors. Even under the best of circumstances, bishops were exiled for standing on principle. Also take a look at 21st century America where a lot of people these days are offended by the words "Merry Christmas." In a fantasy setting, therefore, one must make a decision as to which condition the Church is in and if in persecution, what kind. Prior to the Roman Empire becoming Christian, it was largely illegal to be a Christian. This situation usually played itself out by trying to force Christians to make sacrifices to images of the Emperor. Failing to do so was seen as treason. There were periods when Rome actively sought out Christians to put them to trial, and there were times when it passively did so. Those killed were called martyrs — witnesses. Christians would take and bury these martyrs and then hold services around their graves. This is the origin of churches being named after saints — when churches were allowed to be built, they built them around those places where martyrs were buried. Thus, that was the church of saint so-and-so who is buried underneath. To this day, Orthodox churches keep relics of saints inside their altars in memory of this practice. Both the Chinese and Japanese persecuted the Church as a negative foreign influence. The revolutions in France and Russia persecuted the Church as part of the old order. Although Islam has seen Christians as "people of the book", it still persecutes Christians as infidels. In terms of organization, the Church has four orders of ordination — the laity (yes, baptism is an ordination! ), the deaconate, the priesthood and the episcopate. In terms of the clergy, bishops are administrators, priests are teachers and deacons are servants. For about the first millennia, one was ordained to a particular order for life. In modernity, one becomes a deacon, then a priest, then a bishop. In the ancient Church, all orders allowed married clergy — though one was not allowed to marry after ordination. In the Orthodox Church, this still holds true for Deacons and Priests, but all bishops must be celibate. In the Orthodox Church, women have never been ordained to either the priesthood or the episcopate; however, they were allowed to become deaconesses. This practice existed through the ninth century and has seen some movement towards restoration in the 20th (Greece has allowed them to be ordained for women's monasteries). For the purposes of a fantasy RPG, the order of clergy best suited for adventuring is the Deacon. Bishops are tied to a city. Priests are tied to a parish. Deacons can be tied to a Bishop. Thus, a Deacon can be ordained by a bishop for the purpose of adventuring. Thus, the class has a built in patron which can be a source for adventures. This patron can be as meddlesome and demanding (or not) as a Referee wishes them to be. Using this set-up, the Cleric class can come in three flavors, only one of which actually does any adventuring. This severs class level from church hierarchy. In other words, a 1st level Cleric who is a bishop would have authority over a 9th level Cleric who is a deacon. So, priests and bishops need not be any higher level than 1st to have the kind of respect and authority that their positions demand. Thus, it is possible to have a fantasy world where divine magic has very little broad impact. Spells like Raise Dead would be extremely rare, if accessible at all. In terms of the end-game, a Deacon could still build a stronghold. In a church structure where they are ordained as a deacon for life, they would attract a priest to fulfill that role. Otherwise, they could be elevated to the priesthood or episcopate and take over. The former, however, is more representative of the historical church. Monasteries are led by abbots — which are not necessarily priests. Thus, a stronghold built by a deacon would see the deacon as the spiritual leader and any priest that comes to serve fulfilling that particular liturgical role. For those that use such things, Domains can be explained by way of religious orders dedicated to a particular saint. The Domains would reflect the life of the saint and their path towards God. Thus, Domains like Chaos, Evil, Madness, Death, etc. need not be left out of a game. For example, St. Paul persecuted the Church prior to his conversion. Thus, a fantasy religious order dedicated to a saint akin to St. Paul might have as one of their Domains Evil or Death. St. Paul transformed his emnity towards the Church into evangelism across the Mediterranean world. Thus, clerics dedicated to his order would be expected to transform the Domain of Evil or Death in a similar way. This beautifully succinct statement by St. Gregory sums up the dogmatic necessity for understanding Christ to be both God and Man. If He is not God, then we have no means to be healed. If He is not Man, then we have not been healed. Thus, in a fantasy setting, the Christ figure must emulate perfect divinity and perfect humanity. This means that He cannot become a God either through His excellence or by God descending upon Him. This scenario does not assume the totality of human nature — it ignores conception, growth in the womb and childhood. Therefore, all of these things would be left out of Christ's salvific activity. All of our experience and existence must be assumed in order to save it. This includes death. Psalm 22, written some 300 years prior to the invention of crucifixion, describes in detail Christ on the cross. Christ tells His disciples multiple times that He must be turned over to the Gentiles to be killed. In iconography, the Nativity depicts the manger as a deep, dark cave; His bed as a tomb; and His swaddling clothes as a burial garment. In other words, the whole point of the Incarnation is the crucifixion — the Christ must die in order to destroy death. Crucifixion is a heinous means of killing someone. It is designed to torture and kill slowly over several days. The amount of stress it puts on the body is extreme and it takes advantage of our own instinctual desire to survive in order to prolong agony. It was a death sentence reserved for the lowest of the low — outsiders and criminals. The Romans wouldn't dream of subjecting a Roman citizen to such a death because it was too horrible and too humiliating even for someone who betrayed the Empire. God, in the person of Jesus Christ, was not only willing to subject Himself to such humiliation and horror, but transformed the instrument of death and torture into a symbol of everlasting life. Thus, the cross need not be a cross in terms of a fantasy world. In fact, I would argue that we have lost the sense of divine irony that is the cross — we no longer see it as a device of extreme torture — and that using another device would actually more effectively communicate the true meaning of the cross. The holy symbol of those who follow the Christ is the instrument of torture used to kill the Christ. For example, in the Chronicles of Narnia, Aslan is shaved, tied down upon a rock and killed by a knife. The holy symbol could be any combination of these instruments — the knife, the rock, or the ropes. Of course the ultimate purpose of the crucifixion is the resurrection, the ascension into heaven and the enthronement at the right hand of the Father. Our human nature, in the person of Jesus Christ, is participating in the divine nature of God right now. In terms of a fantasy world, this is the mechanism by which divine magic works. Clerics join themselves to the Body of Christ — the Church — and through their ordination have direct access to the power of God. Divine magic is a metaphor for the miracles of God worked through the people of God. The pseudo-Christian overtones of Cleric spells in 0e represent this quite well. It is all made possible because the Christ died and then took our humanity with Him to sit in glory and the right hand of the Father — in our humanity, we have access to His divinity. The whole of the Old Testament is full of stories that are impossible to import into a fantasy setting — they are too specific to the geography and culture of what we call the Middle East. There are, however, metaphors and motifs that you can hint at in a fantasy setting. St. Paul calls the Law a curse because its primary purpose to reveal to us our sin — our separation from God. No mere human being is capabe of fulfilling the Law, because we all sin. When compared to the Law, our lives are all a sinful mess. Even the greatest of us are cursed by the Law because they, too, sin. Thus, when we see ourselves and all of humanity from the perspective of the Law, it becomes very clear that we are incapable of saving ourselves — we need God, because only God can save. In a fantasy setting, there can be any number of things that are constant reminders of the distance between fallen humanity and God. These coud be physical monuments that dot the landscape, they could be progressive mutations that are manifestations of sin, they could be monsters that are born of sins humans commit, etc. The underlying point is that sans God, humanity is cursed and that God has revealed this through the Law (or its fantasy analogy). For the purposes of building a fantasy word, one only need to understand prophesy in terms of Christ. The OT actually tells us more about Christ than does the NT. Thus, prophesy can be hinted at with no real details (unless you feel so inclined) because they all predict Christ. There are several instances in the OT when a divine figure like that in Daniel 3:35, often call the Angel of the Lord, who the Fathers of the Church understand to be the Son of God before He became incarnate. In may cases, He prefigures the salvific action of the Incarnation, such as saving Shadrach, Meshach and Abednego from the fire. In a fantasy setting, there can be a few flavor stories about the Angel of the Lord — the pre-Incarnate Christ — making dramatic appearances to save people who are faithful to God prior to the Incarnation. Throughout the OT there are people and things that prefigure Christ. The most obvious of these is Moses. His upbringing as an Egyptian and his self-imposed exile made Moses an Other — though he was a Hebrew by heritage, he never lived among them. Despite this, he went to his people as a Hebrew to save them from slavery. God finally freed them by having death passover their households — marked with a cross of blood. Christ came to us as a human being, despite being the radical Other — God. He saves us from the slavery to sin and death by being crucified on a cross so that death is destroyed by death — it will pass over us. In the above quote, Moses prefigures the crucifixion. The saving action of having his hands lifted is accomplished in cruciform by having Aaron and Hur hold up His hands. King David is annointed (oil poured over his head) as King. Christ and Messiah mean "the Annointed One." For the sake of a fantasy setting, there can be any number of people who prefigure the Christ — the story can be as simple as the quote above. Someone secures victory over the forces of evil by an action that suggests the means of torture and death suffered by the Christ. For those of us interested in creating a fantasy world based on Scripture, the Flood is problematic from the perspective that it wipes clean from the world a fantasy staple — the Nephilim (giants) and their monstrous children. It is also troublesome from the modern scientific point of view which understands millions of years of prehistory with all kinds of wildlife that were wiped out before they ever had a chance to board the ark. At this point, I must emphasize the primary purpose of Scripture — the revelation of God. Although it has historical elements, many of which can be corroborated by archeology, the Bible is not an historical document. It is revelation. It answers the question, "Who is God?" and from a Christian perspective, "Who is Jesus Christ?" As such, the story of the flood needs to be understood from this perspective. Note that the cause of corruption on earth is humanity. We have turned our back on God and have taken all of creation with us. But for the goodness of one man — the choice of Noah to seek to be with God — God would have allowed creation to plummet toward destruction and return to nothing. God allows us the freedom to choose Him or choose to reject Him. In Eden, God gave the garden to Adam. When Adam chose to turn His back on God, the garden was taken away. The story of the flood is the flip side of the Eden story. God was willing to take everything away from humanity. Noah chose to turn towards God. Thus, God allows His creation to continue to exist. Ultimately, the primary purpose for the story of the flood is the covenant made by God. When God makes a promise, He never breaks it. All of His promises have been and will be fulfilled. This metaphor can be found in iconography, where the ark has been equated with the Church. Christ fulfills God's promise to all of creation by becoming Incarnate and intimately uniting Himself to His creation. The Church becomes the safe haven from the storm of a fallen world. When creating a fantasy world, the flood is necessary only in metaphor, not in actuality. There need to be humans that turn toward God, even in the midst of corruption and evil. God, in some way shape or form, will make covenants with His people. From a Christian perspective, these covenants will be fulfilled in the person of the Christ.